Many years back I joined a local jam group called the Westman Jams. I quickly found that most of the musicians there tended to play Traditional Country Standards and there was precious few songs performed there that I wasn't familiar with. So I decided to make a point of finding stuff, on the net, that I had never heard and found interesting. I would learn these songs by heart and show up at the jam with a new song every month. Now the fella, (Reg Jones), who had started this jam up, had moved to Manitoba from Ontario. He had started the jam because he didn't know anybody in the local area to jam with. As it turns out, he only needed to put out the invitation and folks came to play music from all over the place! What has this to do with this song? Well, as I scanned the net, I came across a folk singer named Stan Rogers and his extensive library of well written tunes. One of these songs was called 'The Idiot'. It was about a fellow from back East who was forced to make a hard decision due to a turn down in the economy and so moved out West. I learned this tune just for Reg Jones and I told him so. He thought it was funny, but I thought it was fantastic! 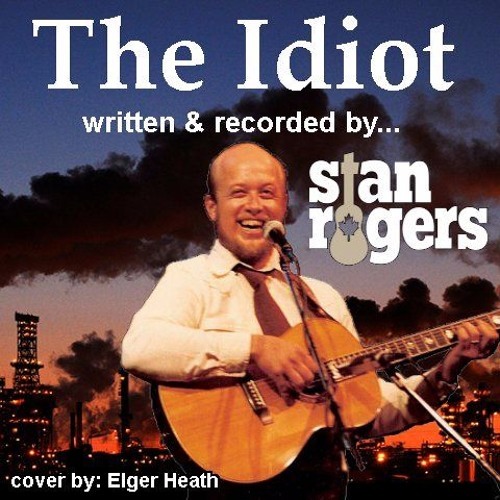 So Now I would like to do, for you, my cover of 'The Idiot', that was written and recorded by Stan Rogers.